What is the Strategic Research Project on University Reform? Funded by the Ministry of Education, Culture, Sports, Science and Technology (MEXT), the research project was initiated in 2008 to respond to the Governmental Basic Policies for the Economic and Financial Reform which was adopted in 2007. 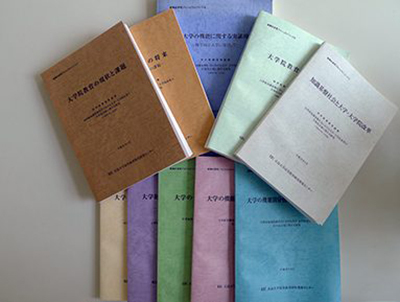 The purpose of this research is to identify ways to reform Japanese universities at the undergraduate and graduate levels to enable them to contribute to local, national, and international communities in the knowledge-based society. 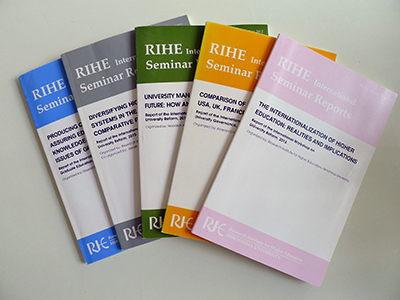 Under this project, RIHE researchers deal with six topics: 1) reforming graduate education to make it eligible to be ranked among the top-level institutions in the world; 2) cultivating talent and quality assurance in the 21st century knowledge-based society; 3) internationalizing and diversifying of higher education; 4) developing local higher education; 5) obtaining competitive resources for research and their allocation; and 6) reforming block grants for National Universities. The Institute also convenes international workshops on graduate education which include a number of research activities and has published research results since 2008 and which have continued through 2009 and beyond. Funding has been received to continue this research project after having operated a large five-year project from 2008 to 2012. Today, our higher education system is emerging in a completely new environment and thus we need to perform our research with fresh ideas and approaches. The Research Institute for Higher Education (RIHE) in Hiroshima University is in the best position to perform this research project that requires high-level talents and wide-ranging perspectives. I believe that our research results must be shared with all the people in the higher education community, including policy makers. I invite all people whom this concerns to cooperate with us to make our research endeavors as fruitful as possible. To get more information, please visit this page.